3rd November 2018. Peacefully at hospital aged 69 years, late of Spa, Ballynahinch. Dearly beloved husband of Hilary, much loved and loving father to Mike, Roger, Caitlin and the late Nick and Grandpa to Ruby Joy. A service of thanksgiving for Stephen’s life will take place in the Chapel of Unity Methodist College, 1 Malone Road, Belfast BT9 6BY on Saturday 10th November at 1.30 p.m. (A private cremation having preceded). Afterwards for light refreshments at Harlequins Rugby Club, 45 Deramore Park, Belfast BT9 5JX. 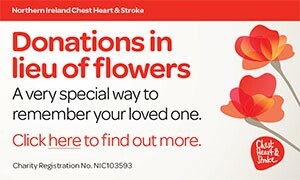 No flowers please, donations if desired for Extern (cheques payable to Douglas Donations Account) c/o 20 Dromore Road, Ballynahinch BT24 8HP. I am sorry to tell you that Stephen Patrick KIRKWOOD has passed away.